Learning the fundamentals of reading and writing is a cornerstone of first grade. From reading the morning message to personalized reading folders, first graders at EHS read throughout their day. A unique aspect of the first grade reading program is Roving Readers. During this special time every week, each first grader travels through the halls of the school to sit down with an administrator who is waiting to hear that child read. A cornerstone of our program is reading groups, when first and second graders come together twice a week for reading comprehension instruction. Students learn the fundamentals of plot analysis as they identify character, setting, and sequence of events. Next, each reading group participates in an author study, allowing students to compare and contrast the author’s books and draw connections to their personal lives. Each year, students learn how to navigate nonfiction texts by completing an individualized science research projects. At the end of the year, students enjoy book discussions with their peers as they read leveled chapter books. To guide our first grade writing lessons, we utilize Wilson’s Fundations program, a researched based curriculum that explicitly breaks down the rules and patterns of the English language for reading and writing. The 6+1 Traits of Writing approach introduces the concept that strong writers brainstorm ideas, organize their thoughts, and choose words that reflect their voice. To explore the writing process, students write everything from creative stories to informative essays, all of which are published into books. One of the highlights of first grade writing is the Monday Slice, a journal entry that children compose at the beginning of each week, which provides a vehicle to integrate all of these skills and ideas. Using our ThinkMath! Program, first graders solidify the basics of addition, subtraction and place value. Through money, dice games, and cards, first graders strengthen their math competency, number fluency, and reinforce fundamental skills. Students also explore critical thinking and problem solving strategies by playing games that demonstrate probability and practice place value. Students also explore early coding skills, map reading, and geometry. Because our students receive both direct instruction and opportunities to explore concepts through games, EHS first graders create meaningful connections between numbers and patterns which builds a strong foundation in mathematics. Our first grade science curriculum provides students with the opportunity to participate in many hands on experiments. Every child identifies as a scientist as they learn to use their science journal and utilize all their senses. Children delight in learning about weather systems in the fall – observing the changing of seasons and building their own weather tools. The unit culminates with individualized studies of weather systems and the creation of individual students reports using our green screen. In the Spring, first and second grade combine for a joint science unit, alternating every other year between “Biomes” and “Insects.” Using a variety of plants and vegetation, we build models of each biome we study. When studying insects, we observe live critters in ant farms, worm tunnels, and bee hives. Children participate in a second individualized study of an animal or insect, tying in non-fiction texts along with an art project. Finally, the children perform in an engaging musical that showcases their learning. The play and projects are often a highlight of first grade. Our social studies work centers around building community. Children begin the year by considering rules for their classroom community. First graders also consider the qualities that make a good community member, identifying those qualities in themselves and their classmates. Finally, students apply these skills when they build their own city and consider important people and places to include. First graders also learn the basics of economics, how to discern between wants and needs, goods and services, and how people make and spend money. This unit teaches children to continue thinking about how they relate to their community and culminates in the children running a market at the school. Through play, students conceptualize these ideas as they create a strong community together. The TalAm curriculum is used to teach Hebrew reading and writing. 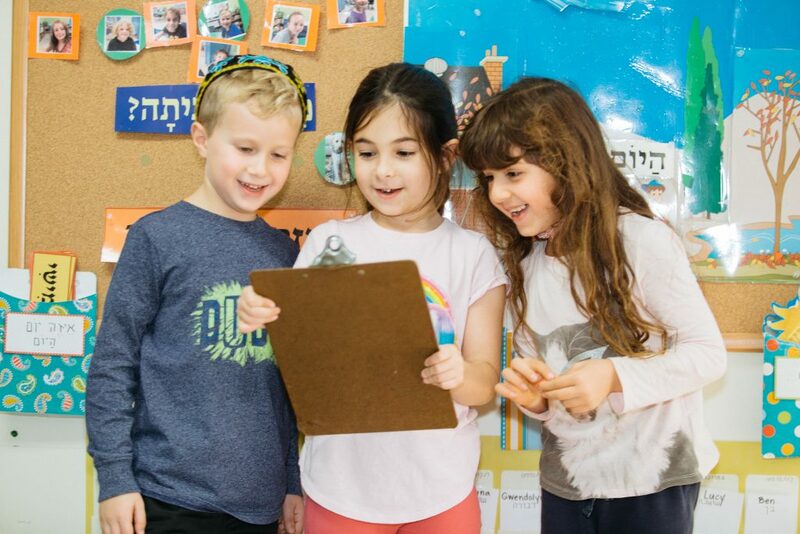 The program provides stories, music, workbooks, and interactive SmartBoard activities and is supplemented with Israeli children’s books for creating stories and role playing. Students are encouraged to write simple stories based on these mentor texts. Some units of study include community workers, clothing, body parts, and animals. The TalAm curriculum is used to teach multiple stories from the first book of the Torah. Stories are told in Hebrew using Godly Play, role playing, and puppets. The children create their own Torah book (parasha) in Hebrew with their favorite parts from the narrative. Selections from this book are read as a part of a year end program. Students continue to learn the meanings of prayers from the morning service and create their own prayer books which include personal interpretations of the prayers. At the end of the year, the children have a special ceremony where they showcase their handmade prayer books and receive their own personal prayer book. We learn about the holidays through the TalAm curriculum which includes vocabulary, a workbook, stories, and songs for each holiday. Students learn the history, symbols, and traditions associated with each holiday and experience them in school through different mitzvot. Students also create handmade projects coinciding with their holiday studies. The goal of our music program is for students to become skillful and enthusiastic music makers through music literacy, participation and performance. Through joyful discovery of classical and contemporary music, students cultivate musicality and knowledge. First grade students continue learning to sing in-tune with expression while gaining confidence on stage. Additionally, first graders begin learning to read music and play several instruments including xylophones, bells, and other percussion instruments. Music is integrated across the curriculum as students sing and perform to enhance understanding of subjects from social studies to Judaics. Students work with a variety of drawing tools, paints, and papers. Students learn techniques for drawing, painting, weaving, printmaking, and collage. In first grade, students expand on their knowledge of elements of art such as line, shape, color, and texture. Emphasis is put on the creative process rather than the finished product. Throughout the year, art is integrated with units of study in the classroom as art helps children use visual content to understand subjects more clearly. In first grade, students begin the year learning how to express emotions using facial expressions, gestures, and body language. Students demonstrate these abilities by taking turns acting out stories and creating mini-scenes of their own about everyday situations. During the second half of the year, students work towards a musical performance, practicing established skills while developing new ones. Students also gain experience working in an ensemble as well as taking personal responsibility for their own individual parts. In physical education class, students are encouraged to participate in low and high energy activities with a focus on physical coordination, sportsmanship, and problem solving. Students learn the fundamentals and rules of major sports, as well as physical fitness, stretching, and agility. Units over the school year include soccer, flag football, basketball, handball, strategy games, and floor hockey. Using demonstration of skills, review of age appropriate rules and scrimmages, students learn new sports, the importance of physical fitness, respectful play with others, and how to engage in healthy competition.